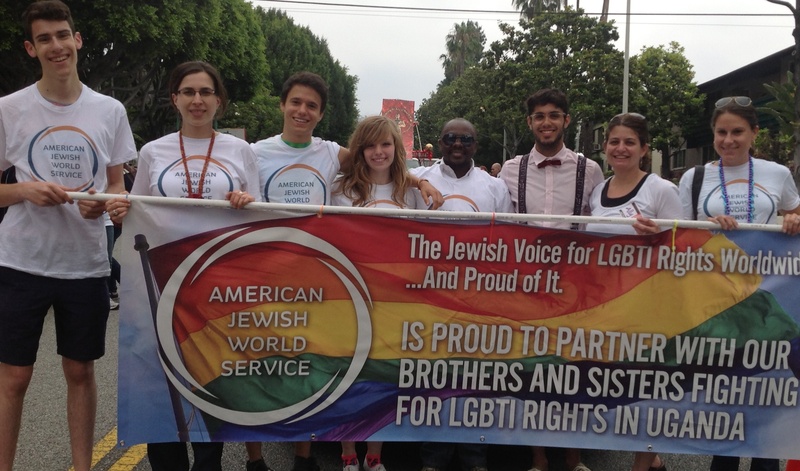 Julius Kaggwa and a group of AJWS LA staff and supporters ready to march! Los Angeles celebrated LGBT Pride the first weekend in June with its spectacular annual pride parade through West Hollywood. AJWS supporters marched with a banner proudly declaring that we are the leading Jewish voice for LGBTI rights around the world. Surrounded by volunteers decked out in feather boas, beads, and rainbow flags, we were privileged to march with Julius Kaggwa, a prominent LGBTI leader from Uganda, whose work AJWS supports. Perched on the back of a white convertible, Julius held up his arms in a victorious salute and crowds of jubilant supporters reacted with joy and admiration when they saw him. To say the least, this warm reception in LA is quite a contrast to what Julius experiences in Uganda, where the LGBTI community lives in fear and secrecy, persecuted by the state and right-wing religious activists. Folks cheered when they saw Julius and our AJWS banners and Jewish stars fashioned from rainbow-duct-tape. Some who saw us probably learned about AJWS and our work for LGBTI rights for the first time. Some exclaimed, “Hey, Jews! I’m Jewish!” to which I responded: “Mazel Tov!” Others shouted, “L’chaim!,” (“to life”) or “I love Jews!” – including one of the MCs of the event, a Latina drag queen whose “I love you!” came across playfully as “I love Jew!”. Many onlookers were visibly impressed to see a Jewish organization supporting such an important cause. Members of other organized faith groups smiled with recognition of our public role in this shared struggle. The crowd’s pride in us bolstered our commitment to this work – so much pride all around! Jocelyn Berger is a Program Officer for American Jewish World Service.